Case Study – Creation of IT Support Questions in Text Format to Train an Artificial IT Service Desk Agent. Thousands of Clickworkers formulate possible IT support inquiries based on given IT user problem cases. This creates a multitude of query formulations which demonstrate how real users could communicate via an IT support chat. 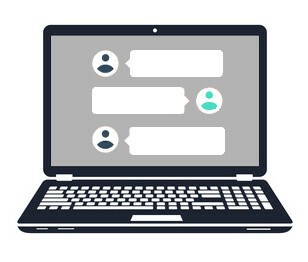 With these text samples a chatbot can be optimized for deployment as an artificial IT service desk agent, and the recognition rate considerably increased. As a rule chatbots access canned knowledge databases, in which answers to diverse questions are recorded. The principal challenge when programming chatbots is correctly recognizing the users’ questions, classifying them accurately in the database and issuing the correct answer, or asking valid follow-up questions if required. In addition, chatbots learn from each new inquiry. The more requests a chatbot has processed, the better trained it is. The knowledge database is continually expanded, and the bot’s detection patterns are refined. Depending on the field of application for the chatbot, thousands of inquiries in a specific subject area can be required to make it ready for use. Moreover, a large number of additional queries are necessary to optimize the bot, working towards the goal of reaching a recognition rate approaching 100%. Our Clickworkers have reformulated 500 existing IT support queries in seven languages, and so have created multiple new variations of how IT users could communicate with a support chatbot. Each predefined question is restated in three versions with different perspectives (neutral, he, she) for those languages that differentiate noun genders, or in two versions for languages that don’t. In an additional job type, Clickworkers formulate completely new queries for a fictitious IT support. For this task, Clickworkers receive a total of 50 different situations/issues. … along with sample sentences which echo inquiries from company employees to an IT support unit. Per language and issue, 20 Clickworkers each formulate six questions in the first person, the way they would ask them in an IT support chat, to describe the given problem. With the help of the numerous possible query formulations, the manufacturer trains the chatbot specifically for use as an IT service desk agent, and considerably increases the recognition rate and quality of the bot. The project is discussed with the customer. The resulting tasks are defined and set down in a briefing for the Clickworkers. clickworker sets up the project, and publishes the text creation and/or query formulation and reformulation task as individual jobs on the clickworker platform. Numerous Clickworkers with the applicable native languages accept the jobs simultaneously, and create the texts in the Clickworker workplace according to the job guidelines. All compiled texts are delivered to the customer for approval via an API connection.